Charles Mike Yazzie Navajo Concho Belt Sterling Silver Turquoise Leather 1970. 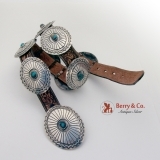 This amazing American sterling silver belt features 9 conchos and a larger concho buckle, which all feature inset Turquoise as well as engraved Navajo designs. The belt it's self is made in the USA by Bushy Creek and features extremely detailed floral patterns along its entirety. Made by the amazing Navajo silversmith Charles Mike Yazzie. The belt is marked 32. This amazing belt is 36 5/16" long. 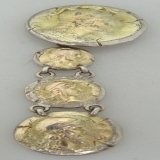 The conchos measure 3" long by 2 5/16" wide. The buckle measures 3 3/8" long by 2 11/16" wide. The Turquoise stones measure between 16mm x 10mm and 11mm x 10mm. The total combined weight of the conchos and buckle is 14.2 ounces Troy. Reuge Swiss Miniature Music Box mounted in an engraved and engine turned sterling silver gilt case by Morelli Sirio of Florence, Italy, c.2960. 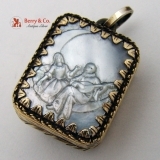 The top of the case has a wonderfully carved Mother of Pearl scene of a man serenading a woman, with the pair sitting on a crescent moon. The carving is held in place by 28 broad point engraved tabs surrounded by a wire rope border. The sides of the case have foliate engravings and a loop and jump ring. The back of the case has engine turned decorations, the winding knob, marked REUGEâ€¢ PATâ€¢ on one side and ST-CROIXâ€¢SWISS on the other, on one corner of the back and the stop start pull knob on the other. The 17 note music box is in working condition and the gilt finish has a nice patina. with the carved Mother of Pearl being in excellent condition. It weighs 21 grams and is 1" long, 13/16" wide and 7/16" thick. The soft, warm, original finish is present, with no buffing or machine polishing. The excellent original condition and clear, crisp detail, with no monograms, removals, repairs or alterations, make this an especially attractive offering. American sterling silver perfume bottle with beautiful hammered finish and Medallion decorations, c.1880s. This handsome bottle is 3 5/8" long and weighs 10 grams. The excellent original condition and clear, crisp detail, with no monograms, removals, repairs or alterations, make this an especially attractive offering. The soft, warm, original finish is present, with no buffing or machine polishing. 14K yellow gold hand engraved antique brooch with yellow and white paste stones, c.1850. 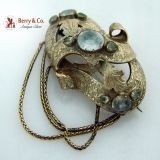 This attractive and unusual scroll form brooch has hand engraved scroll and floral decorations and is 2" wide, 1 1/2" wide and had three hanging hand made gold chains suspended from it lower edges. The brooch weighs 13 grams and has been carefully tested for gold content and found to be at least 14K. An excellent opportunity to own a stylish example of work by a craftsman seldom seen outside of his native South Africa, the bracelet is in excellent original condition, with no monograms, removals, repairs or alterations. The finish is excellent, with the desirable hammered finish being present. 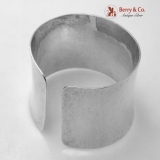 Dimensions: Diameter: 3 3/4" Adjustable Height: 1 7/8" Weight: 96 grams or 3.1 ozs Troy. Maker & Marks: Kurt Jobst Johannesburg South Africa Stylized "JK" Jobst; Sterling; â€¢925 CLICK HERE for more about Kurt Jobst. 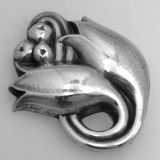 Danish sterling silver Tulip brooch by Georg Jensen 1945. This elegant brooch measures 1 3/4" long, 1 3/8" wide. The excellent original condition and clear, crisp detail, with no monograms, removals, repairs or alterations, make this an especially attractive offering. The soft, warm, original finish is present, with no buffing or machine polishing. American sterling silver and 14 K Gold watch fob by Shiebler 1880. This handsome watch fob measures 3 3/4" long. The excellent original condition and clear detail, with no monograms, removals, repairs or alterations, make this an especially attractive offering. The soft, warm, original finish is present, with no buffing or machine polishing. Russian 84 Standard Silver and enamel bracelet 1908-1917. 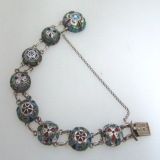 This beautiful bracelet measures 7" wrist diameter, 1/2" button diameter. The excellent original condition and clear, crisp detail, with no monograms, removals, repairs or alterations, make this an especially attractive offering. The soft, warm, original finish is present, with no buffing or machine polishing.